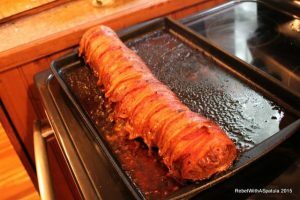 I have found that one of the easiest ways to get enough protein for myself and the family is a good solid meatloaf. I can adjust the flavors so we don’t get sick of it. And I also liked the idea of putting something inside it to make it a “slice and server” meal! Unfortunately, the damn things break open on me while cooking. Or, if they do stay together, they basically fall apart when sliced. Then I thought, I can wrap this sucker. I can bind it. WITH BACON!!!! Mix all meat ingredients in a bowl, by hand. 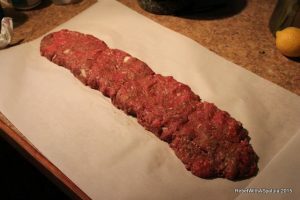 Make a log of the meat on a large piece of parchment paper. I roll it out to about a half inch thickness. 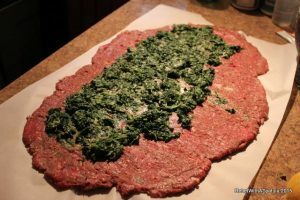 Now spread your spinach down 2/3rds of your flat surface, leaving more room on one side so we can get a good meat-to-meat seal (????). 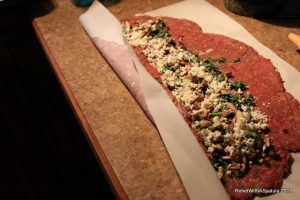 Then add the chopped mushrooms and feta and Parmesan! Now, we carefully flop over the edge onto the filling. 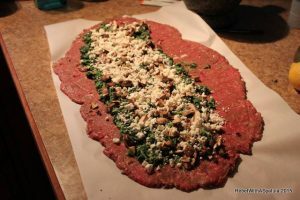 And then we carefully peel the parchment paper from the folded over meat. This can be delicate work if you have rolled too thin! 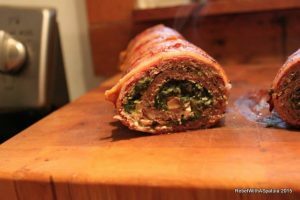 Continue the roll and peel…. Then when you have covered all the filling and have about one roll-over of meat exposed. Fold it BACK from the other side. This puts your seem near the top of your roll. WHY? Because….. you shall see…. 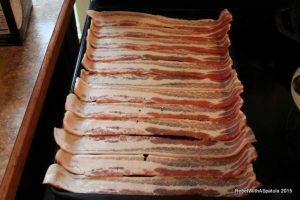 Half a rasher or more of thin-sliced bacon is prepared thus…. 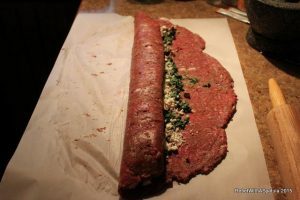 This is usually the point where I realize my meatloaf roll is too damn long to put on my baking sheet. This time I was lucky. 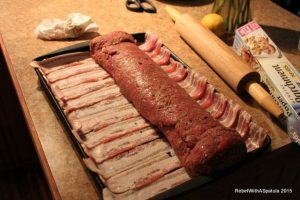 Carefully, we roll the meatloaf onto the bacon. I TRY for the center, but as long as I have some on either side, it doesn’t matter much. WHAT DOES matter… is that the seem is now on the bottom. Also… I did make the damn loaf too long, but a little squishing was all that was required. 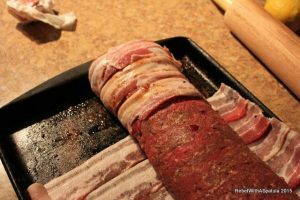 The bacon is then stretched over from one side, then overlapped with the other side as tight as you can without breaking the strip. The loaf is now wrapped, tightly and evenly. Then we slide it into our now warmed-up oven and bake for 40 minutes before checking on it. We want the bacon to be slightly crisp but not burned into a crumbly armor. Mine took almost an hour, checking every 5-6 minutes. Here it is, right out of the oven! I let it cool for 10 minutes before cutting. 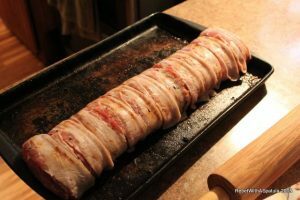 We do have a few bacon strips that decided to stick out, but the loaf itself is still tightly wound! 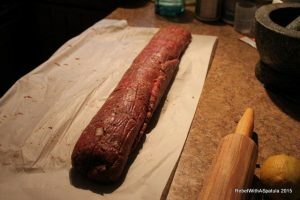 The cut into loaf is tight and filled and does not come unwound on the plate!